Moc Chau district exported its first batch of passion fruit to France late last year. Ms. Nguyen Thi Xep used to grow chayote on the family’s 6,000-square-meter farm. In 2016, she switched to passion fruit, with technical assistance from Nafoods Northwest Company, an innovative fruit and vegetable grower, processor and exporter. 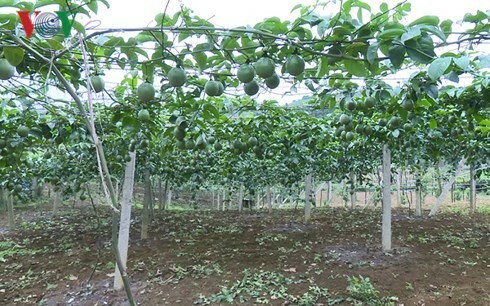 Nguyen Van Dinh of Moc Chau town decided to dedicate all of the family’s land to growing passion fruit after a one-year pilot program in which it brought higher profits than any other crop. “This is my third crop of passion fruit. In the first year I planted 500 trees and earned nearly 13,000 USD. In the second year, the income was lower because of insect pests. This year I’ve taken special care of the trees and expect a bumper crop,” said Dinh. In 2015, Nafoods Northwest Company signed a contract with several local households to pilot Taiwanese passion fruit on 5ha. The company provides seedlings and high-tech farming techniques, and promises to buy the entire harvest. Pham Duc Chinh, chairman of the Moc Chau district People’s Committee, praised the high productivity and profitability of the three-year pilot program. Passion fruit products are the first line of products for which Nafoods has set food hygiene safety standards and applied them to the entire production process. The success of passion fruit in Moc Chau has led to the model being expanded to five other districts. Son La plans to have 1,000 ha of passion fruit by the end of this year and build a 5,000-hectare production zone by 2021.